One of the legendary guitarist's underrated albums has been reissued as part of Concord Music Group's Original Jazz Classics Remasters series. 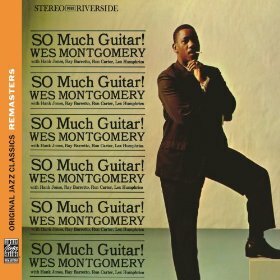 So Much Guitar!, by Wes Montgomery, is one of five new titles released by Concord Music Group in their ongoing Original Jazz Classics Remasters series. Wes Montgomery (1923-1968) was one of the most innovative jazz guitarists of the 20th century. His use of the guitar as the main instrument, plus his technique of picking the strings with his thumb to create a unique style, and his ability to expand his sound from the exploration of single notes helped to expand the guitar’s place in jazz music. His recording period can be divided into three distinct periods. His time with Riverside Records, 1959-1964, was his most prolific and productive and found him leading small groups. His period with Verve, 1964-1966, found him in basically an orchestral setting, complete with strings and brass. Just prior to his death, he signed with A&M and moved in a very commercial pop direction. This latest reissue is wisely taken from his Riverside period as So Much Guitar! is one of the better, if underrated, albums of his career. When he went into the recording studio in August of 1961, he was accompanied by pianist Hank Jones, bassist Ron Carter, drummer Lex Humphries, and conga player Ray Baretto. The key was Carter, who was near the beginning of a career that continues today as one of the most prolific bassists in jazz history. He was the perfect foil for Montgomery as his talent on the bass pushed him to better performances. The most interesting tracks are Montgomery’s two original compositions, “Twisted Blues” and “Something Like Bags.” The ballads, a subtle cover of the 1940s tune “One for My Baby (and One More for the Road)” and “While We’re Young,” are good examples of the Carter and Montgomery interplay. The Duke Ellington piece “Cotton Tail,” which in its original incarnation was a sax-driven tune, was adapted to feature guitar as the main instrument. As with all the albums in the series, the sound is clear and crisp and the booklet gives a fine history of the albums creation and music. The original liner notes are also included. There were no outtakes from the sessions to add as bonus tracks, so the producers went in a different direction and added eight tracks that were recorded early in 1961 at The Cellar in Vancouver, British Columbia. These include Wes Montgomery with Buddy Montgomery on vibes, bassist Monk Montgomery, and drummer Paul Humphrey. The performances of compositions such as “Snowfall,” “This Love of Mine,” “On Green Dolphin Street,” and “Angel Eyes” may not have the sophistication of the previous studio tracks but they are good examples of the guitarist’s technique and style as his playing is out front. The eight performances were released as The Montgomery Brothers in Canada, so you are essentially getting two albums for the price of one. So Much Guitar! was a pivotal album in the career of Wes Montgomery and is an essential listen for any fan of his or of jazz guitar.